This year I have decided to write a monthly review at the end of each month to summarise what I’ve been up to and also to track my goals for the year, including the 365 Instagram challenge and reaching my savings goal. January was full of ups and downs; basically a normal month in my life. However, I am now on the pursuit of happiness and good health, and so in January I started to make decisions that will make my life somewhat better, hopefully. February may bring ever more changes and I am really looking forward to stepping out of my comfort zone. As you are probably already aware, Tyrone and I have decided to move from our little one bedroom flat in the city centre to a house, probably on the other side of the Mersey. In fact, today we are going to view the house we really liked, but couldn’t go inside of when we tried to visit last week. So maybe, just maybe, as you are reading this I might be signing on the dotted line. It’s an exciting and scary journey for us both, but it’s definitely a step in the right direction. When I heard that Yoga with Adriene was doing another 30 days of yoga challenge, called Yoga Camp, I was determined to join in. I loved 30 Days of Yoga, so I thought I would enjoy Yoga Camp, but sadly I gave up after about 5 days. It’s damn hard doing yoga routines that are over half an hour long (the videos were much longer for Yoga Camp than 30 Days of Yoga) every single day, especially when my steroid injection had worn off. Now that I’ve had a steroid top up I’d like to give Yoga Camp another go but do it at my own pace, rather than doing a video every day. I decided to add myself to the organ donor register this month, and I wrote about my decision to do so in this post. Although it only took 2 minutes to fill in all my details, it felt like a really significant decision. I’m so glad that I’ve finally done it. 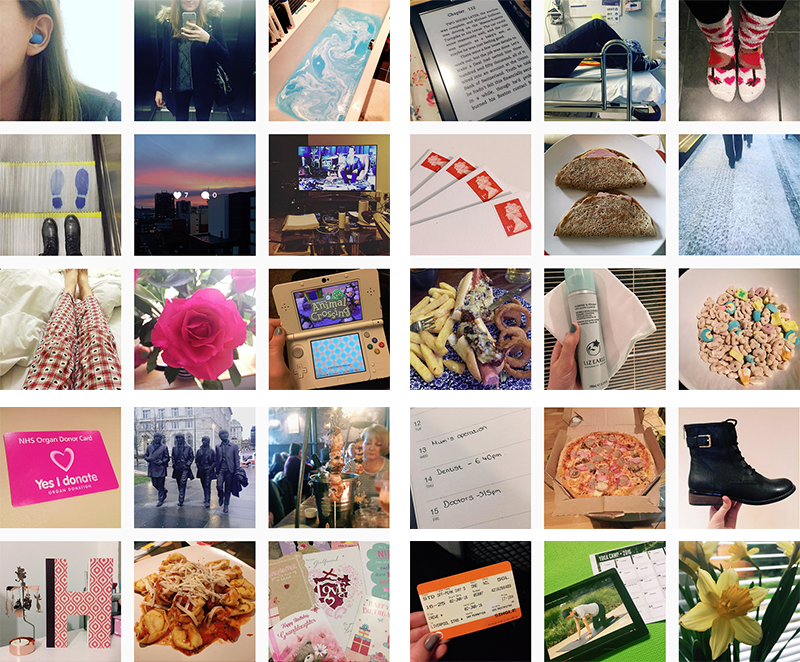 The 365 Instagram challenge involves taking a photo everyday for a year. I’ve actually found it really challenging, and there have been days in which I have almost completely forgot to post anything. Some days I feel like I’ve done nothing exciting and that I have nothing worth sharing, so I think that a lot of my Instagram posts have been crap this month. However, I’d really like to up my game and be more creative with this challenge. If you’d like to follow along, you can find me on Instagram right here. As I mentioned in my 2016 goals post, I am trying to save £5,000 this year. This month I have saved £396. My main goal for February is to find the perfect house for Tyrone and myself, and I plan on focusing most of my time and effort on that. I would also like to get back into doing yoga more regularly, and to make more time for baking, but I guess we will just have to wait and see what happens with the impending move. How was January for you? Any plans for February? Thanks! I hope I can keep it up for the rest of the year! I think doing the Yoga Camp at your own pace is a good idea. It’s better to do what works for you 🙂 You’re still giving it a try, so I wouldn’t call it a failure! That’s great that you’re an organ donor! And I felt the same way when I did a Project 365 years ago. It was easy to forget about it, and some days were so routine that I didn’t know what to take a photo of. I definitely had a lot of uninteresting photos in the mix. It’s rewarding to look back on it though, especially the further you get. Good luck with it! January was pretty busy for me since work was starting up again, and I had a business trip. I hope to plan a couple get togethers with friends in February! Thank you! It went really well, and we’ve even made an application! We’ve just to wait and see if we get accepted. That first house feeling is amazing. I hope that it all works out for you, my fingers are crossed that you have in fact signed on that dotted line! Congratulations with the savings – that’s very impressive. How did you do it? Thank you. We’ve made an application on the house so now we’ve just got to wait and see. I hope you find a good place and leave behind whatever negativity there is regarding the previous apartment. Haha, I can imagine it’ll be hard to dedicate blocks of time each day forcing yourself into a routine. It’s good that you’re doing yoga in the first place. And it’s really worth admiring that you became an organ donor! With instagram, I often find it difficult to force myself to take a photo, so I hardly do, but when I do, sometimes the need to share opens the eyes to things we didn’t previously see. I bet that’s something that comes out of the challenge. Thank you! I really do enjoy yoga, I just wish I had more time to do the long routines. Maybe! I’m interested to see if I learn anything at the end of the year from the Instagram challenge. Good luck on your savings, I am sure you can do it! January was kind of slow for me compared to other months, but that was alright because I was still doing positive things that have been helping me. 😀 February I plan to do much of the same, but try and include more creative projects! Thank you! Since writing this post we made an application on our favourite house and it got accepted! I LOVE your instagram challenge, I always look forward to seeing them on my feed! I will try and do it next year but I often have lazy days or sometimes dont know what to post but you’ve been posting a lot of amazing things everyday! LOVE IT! Your savings for this month has really got me wanting to save a bit more, even a few pounds every week is definitely beneficial in the long run! Really? Wow, thank you. 😀 That means so much! I remember the first time my husband and I moved out, we weren’t married but fiancé and fiancée, still it was hard, and now 4 years down the road, we found a great place to live at for awhile. I’m glad that you and Tyrone are going in this direction, it is scary but worth having a good place to live at. January has been terrible, but I am hoping Feb is better for us, financially and physically. Oh no! I hope February is better for you too. I think I wanted to try an Instagram challenge at some point, but couldn’t be bothered taking a photo a day. I used to do it when I had a photoblog from 2009 to 2011 and I think that was more than enough attempts for me. Maybe Instagram might be better because it is easy to do on your phone, haha. You are doing a great job saving, keep it up! I am not sure how much I want to save but I try to save about 90% of what I earn weekly, unless I am spending a lot of money for travel, a gift, or bills. That is definitely one of the benefits of using Instagram for a photo challenge! When Empfire was a photoblog all those years ago I rarely ever updated it because I couldn’t be bothered. I think next month I’m going to find it more challenging to save so much as I’m going to have to buy loads of things for my new house. I’ve always wanted to do an Instagram and Yoga challenge. I’m watching a couple of my friends do both and I’m extremely jealous. Sometime this year, I hope I can do a one month challenge of either yoga or posting a picture a day on Instagram. Good luck with everything! I hope you guys are able to move out soon. Thank you! It went really well and we ended up getting the house! “Go big or go home!” has become our motto as a couple!